Today I dropped by school to tie up a couple of loose ends, nothing major. I just checked phone messages and talked to some very dedicated teachers collaborating in the summer time. While at school I walked down the hallways to take a look around. Firstly, I noticed the hard work of our caretaking staff – they do a lot over the summer. Secondly, I noticed that at Our Lady of Assumption School we have a good problem – what to do with all the 20th century teaching stuff that teachers are throwing away. Teachers are throwing away their 20th century tools as they are no longer needed to teach in the 21st century. Simply put, students learn differently so we must teach differently. Now I am a chucker, at home and at school. My father is not, he is now 85 years old and I do not think he has thrown away anything. I like to throw stuff away. As a teacher, I can probably put my 24 years of teaching into a few boxes. If I have not used something for a year or two I am sure to chuck it. At school we have the good problem of trying to decide what to do with some dated stuff. 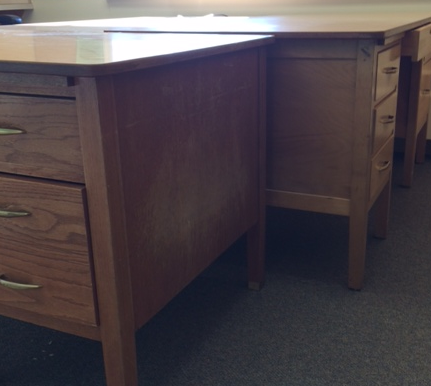 These include things like teacher desks, students desks, shelves, and dated resources. We are not a huge school, but now we have about six or seven large teacher desks in our hallways or spare classrooms as teachers realize they either do not need a large desk or are pleasantly surprised how much extra student space they create when they get rid of their desk. I like to chuck, but I cannot bring myself to chuck six or seven teacher desks. More and more our teachers are wanting students at tables so students can collaborate better. What does one do with all those student desks? Lastly, we have a lot of empty shelves. They are empty because many teachers are throwing out dated resources, resources meant for the 20th century classroom. The dated resources will be chucked. The shelves, well that is another good problem to have. Our Lady of the Assumption School is a terrific learning community. We are not perfect. We do have areas we need to improve upon and we do have some problems. I am happy to say we are dealing with a good problem of moving from the 20th century to the 21st century. My dad may not be proud of me for chucking stuff, but our garbage bins are filling up. As a teacher for the past several decades, I have found myself overwhelmed by outdated resources/references as well. However, since I also teach a number of music classes, I have to state that throwing out any music transcripts or anything of the sort, would raise my hackles. I have numerous music manuscript resources and instruments that I have used, and even though they are decades old, they still have value for learning. My own violin is 365 years old, and in spite of expendetures to keep it viable, it is considered a treasure! Mind you, the $250, 000 we spent on computers 2 years ago is today worth *%^$! Thanks for the comment Val. I know there are many exceptions, but I sure do see an increase of teachers getting rid of dated resources. Thank you for the suggestion, we were able to give some furniture to other schools.